I finished the Gentleman’s Socks with Lozenge Pattern, my March socks from stash. This is Sunbeam St Ives “cheap as chips” wool / nylon mix. I have really come round to liking this yarn after initial apathy. The colours are deliciously heathery in real life. The dark blue has hints of red through it and the green has purplish bits. Although not as soft as a pure merino, it washes into a cushy fabric and is really hard-wearing – essential for a man-sock! I found it hard work knitting on size 0 needles, but the metal Boye “perfection points” were a great improvement on birch or bamboo: no snapping! 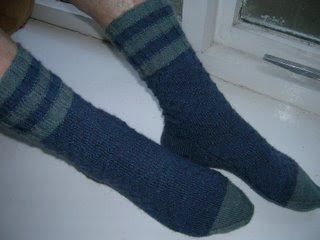 The Nancy Bush pattern (from “Knitting Vintage Socks”) was excellent, as usual. I love the attention to detail in her patterns: a single purl delineating the border between the sole and the upper foot, echoed by a single purl “seam” down the back – lovely! The Gentleman liked them enough to agree to sit on the windowsill to have their photo taken – amazing!